A cigar has two ends – the Foot (already cut) and the Head (sealed and uncut). You will be cutting the head. Hold the cutter in your dominant hand. Position the cutter between you and the cigar. The cigar should be pointing away from you, with the pre-opened end the farthest from you. 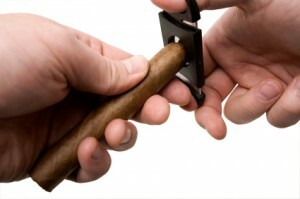 Position the cigar under the blade at the point where you want to cut it. Bring the blade down gently onto your cigar at the right point and rest it there for a second (just enough to establish solid contact). Dispose of the small piece of cap you’ve just cut off. Inexpensive single-blade cutters are widely available and are usually priced at around $3. While this may seem like a bargain, especially for a new smoker not yet ready to ‘invest’ in a quality tool, consider this: an inexpensive cutter may do such a poor trimming job that you’ll end up discarding half your cigar because it doesn’t burn properly. Don’t skimp. Ask your tobacconist for a recommendation.